"They are a little time consuming, but they're definitely worth the effort. You can substitute shredded chicken or pork in this recipe. Serve with hot mustard." In a large bowl, mix together cabbage, carrots, sprouts, celery, and onion. Stir in shrimp, soy sauce, garlic powder, and black pepper. Place 2 or 3 tablespoons of the shrimp mixture into the center of an egg roll skin. Dip a spoon into the water and cornstarch mixture, and moisten all corners but the bottom corner. Fold the egg roll skin from the bottom over the mixture, making a tight tube of the shrimp mixture. Fold corners in from the sides, and press to stick against folded roll. Then roll the rest of the way. Repeat with remaining egg roll wrappers. Pour vegetable oil into a deep frying pan to a depth of 3 or 4 inches, and heat oil to 350 degrees F (175 degrees C). Carefully place egg rolls into hot oil, and fry until golden brown. Remove to paper towels. 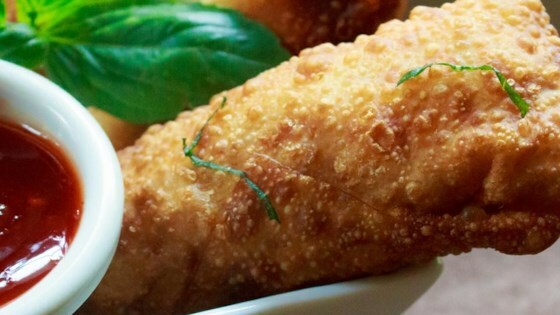 These are the best egg rolls ever! I fried some and baked some in the oven at 400 F for 30 min. Amazing, though I think it was lacking in something. Next time I think I'll add some oyster sauce or something like that. Very good family liked them! to save time i used the cabbage and carrots that come in the bag for coleslaw! Saved me a lot of time and clean up! This recipe turned out great. It was easy to make and everyone loved it! It says 8 servings, but this made 16 egg rolls to be exact! These Eggrolls are very GOOOOOOOOOOOOOOOOOOOOOOOOD!! !ROUVER ROCKS!!! These were not bad, but we did not prefer the taste of the shrimp; it seemed to overpower the entire roll. I'll probably try this again sometime using chicken. These egg rolls were De-lish! My husband and I fought over the last ones! Definatly a recipie I have passed on! These eggrolls are great! Everyone in the family loves them!